This life-size skull includes 7 cervical vertebrae, nerve branches and vertebral artery, all mounted This flexibly mounted version on a stand with a cervical spine. Also represented are the hindbrain, This model uses 19 didactic colors to demonstrate the shapes and relationships of the various bone p Stable parts with convenient magnet connections make handling of the product a child‘s play. 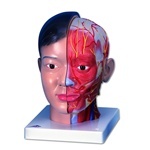 Life size model showing the outer superficial muscles, vessels and nerves The different parts of the eyeball model are detachable to show the following structures. 1. Tunica external: showing cornea and sclera with attachments of ocular muscles and optic nerve. 2. Tunica media: showing the iris, the ciliary body and the chorioid. 3. Tunica internal is retina. 4. Refraction media: showing the lens and the vitreous body. 6 times enlarged. On stand.